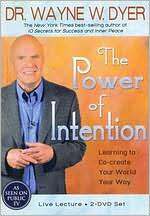 In Dr. Wayne Dyer's public television special, taped live in front of a thousand fans in Boston's historic theater district, he transforms conventional thinking about making things happen in our lives into a profound understanding of how each person possesses the infinite potential and power to co-create the life he or she desires. To accomplish this, Dr. Dyer takes the audience through a journey into the seven faces of intention: (1) creativity, (2) kindness; (3) love, (4) beauty, (5) expansiveness, (6) abundance, and (7) receptivity. Throughout the program, Dr. Dyer illustrates his points with signature stories that move the audience to tears--as well as abundant laughter. The self-actualization phenomenon known as The Secret pivots on the time-honored new age notion of the Laws of Attraction: That is, think positively, and positive things will come to you. This film, originally broadcast over the Internet, has been enhanced and extended for this DVD edition; but it retains the essential elements that have captivated millions. Over the course of its 92 minutes, The Secret introduces a parade of "teachers" hailing from various fields, including psychology, metaphysics, quantum physics, theology, spirit channeling, and personal motivation. Bernardo Bertolucci attempts to mix Buddhist spirituality with childhood fantasy in Little Buddha. When Dean Conrad (Chris Isaak), a Seattle architect, comes home from work one day, he finds two robed Buddhist monks sitting in his living room talking with his wife Lisa (Bridget Fonda). Guided by a series of disturbing dreams, the monks have traveled from Nepal to Seattle because they believe that the Conrad's ten-year-old son, Jesse (Alex Wiesendanger) may be the reincarnation of a legendary Buddhist mystic. The first belongs to Dondup (Tshewang Dendup), a bored mountain villager determined to move to the United States, and Tashi (Lhakpa Dorji), another restless soul whose journey led him to an affair and eventual conspiracy to murder. Tashi's story was related to Dondup by one of the fellow travelers trekking through the mountains on their way to an airplane headed for America. The traveler suggests that Tashi's story may contain an important message for Dondup -- namely, to consider being satisfied with what life has dealt him before setting off to parts unknown. Directed by PBS veteran David Grubin, (The Jewish Americans, Abraham and Mary Lincoln: A House Divided) and narrated by Richard Gere, The Buddha relates the life of the Indian sage who famously gained enlightenment as he sat beneath a fig tree two-and-a-half millennia ago. The two-hour film tells the Buddha's story through painting and sculptures by some of the world's greatest artists and tracks his biography across the sweeping landscapes of northern India. The testimony of contemporary Buddhists -- from Pulitzer Prize-winning poet W.S. Merwin to the Dalai Lama -- provide insight into the ancient narrative of the man who never claimed to be God or God's emissary, but merely a human being who, in a world of unavoidable pain and suffering, had achieved a serenity that others, too, could find. This documentary tells the story of his life, a journey especially relevant in our own times.